Vehicles rallying round dirt roads, usually in a forest setting is a common theme in Europe. The race usually consist of highly optimised European vehicles, known for being lightweight and nimble and many four-wheel-drive. However, as proven by this video, the heavyweights of performance cars, muscle cars with huge V8s can still be capable of powering round these type of tracks. 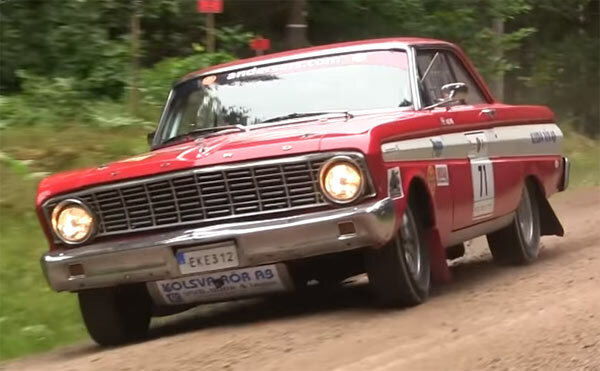 The video is of a Swedish Rally with classic American V8’s doing the heavy lifting. The first question obviously is why this is not more popular in the US as an event and why are the Swedish being the nation that are highlighting that vintage muscle cars are quite capable of this thing? If you still think that a huge Ford Galaxy 500 is not capable of some rallying then one of the comments to the video sums it up quite nicely, ‘Perhaps the most unsuitable rally vehicle ever. BUT it looks, drifts and sounds just perfect!! Love it!! ?’ In other words, even though you’re watching the video and telling yourself this is the wrong vehicle the event, the car is perfectly at home, especially with the right driver behind the wheel. You never know, this video could be a bit of inspiration for some forest located muscle car rallying elsewhere around the globe.